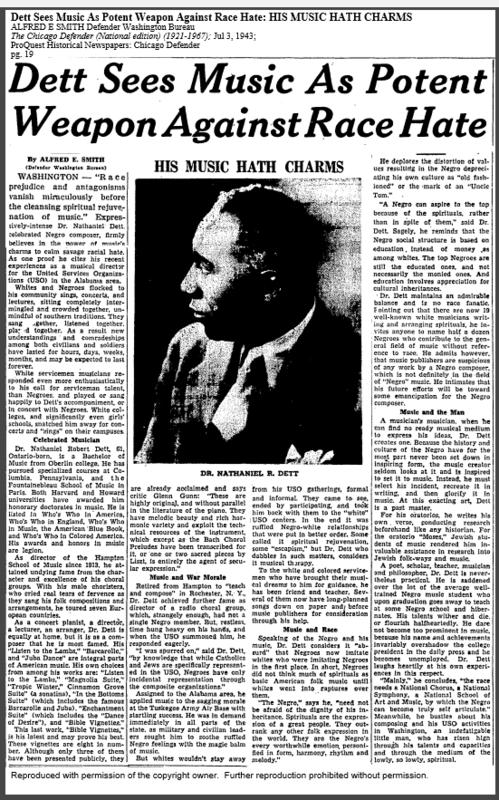 Robert Nathaniel Dett (1882-1943) was a popular African American composer who used spirituals and gospel songs as his inspiration for larger works. His works like the Juba Dance were performed by the Tommy Dorsey Orchestra, and Dett conducted and performed as a pianist in Carnegie Hall. The oratorio can be heard in this playlist below. 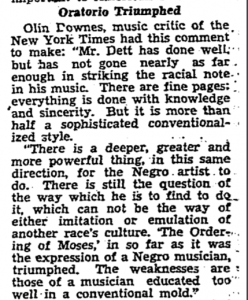 Additionally, Dett mentions the difficulties of being a black person in the institutional music system. 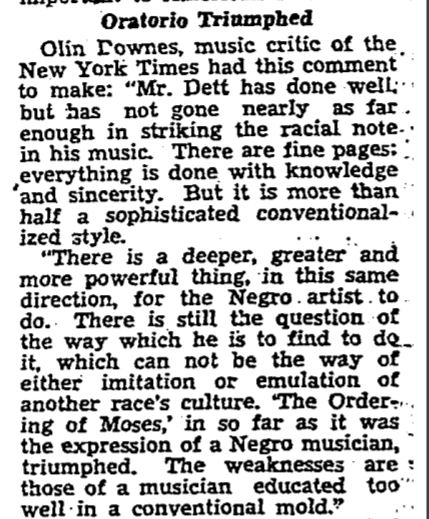 He says that many African Americans who graduate from insitutions with degrees in music aren’t able to fully cultivate their talent, because if they rise to fame they outshine even the president of the institution (on account of the novelty of being a famous black performer). Dett’s work “The Ordering of Moses” contradicts his own statements in two ways. First, it conforms more to western European musical standard practices than to traditional practices in the black community. This is something he directly condemned above. Second, it helped him rise to great fame, rather than let him meekly compose semi-successful pieces. However, he did not seem to outshine the reputation of Oberlin University, where he obtained his degree. There is more to the story, however. If his work had conformed even more toward traditional spiritual practices, white audiences never would have heralded it as such an inspiring and important piece. 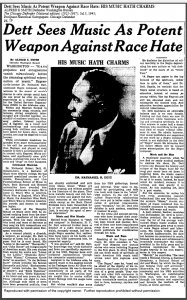 Then, he might not have gained as much fame and thus wouldn’t even have had an opportunity to share his opinions on the state of black composers and performers in the Chicago Defender. He played the game where he had to in order to balance both black and white audiences. If he hadn’t, he’d have been lost to history, and we wouldn’t remember his works or his name. So before we are too quick to judge the contradictions between his composition output and his musical philosophies, we should remind ourselves of the complex situation of being a POC in America. This should especially be taken into account regarding black musicians operating in a largely western European controlled system. Artist Files: Tommy Dorsey , 1950-1975 © The Rock and Roll Hall of Fame and Museum. Popular Culture in Britain and America, 1950-1975.